Russia's Emergencies Ministry says a passenger airliner from Dubai has crashed while trying to land at the airport in the southern city of Rostov-on-Don. MOSCOW (AP) — Winds were gusting before dawn Saturday over the airport in the southern Russian city of Rostov-on-Don when a plane carrying 62 people from a favorite Russian holiday destination decided to abort its landing. The timing was tricky. Two planes had landed just a few minutes before the FlyDubai plane aimed to touch down. On the other hand, a Russian Aeroflot plane scheduled to land around the same time tried to come down three times then diverted to another airport, according to Flightradar24, an aviation website. The FlyDubai pilots chose to put their Boeing 737-800 into a holding pattern, circling for two hours over the city located 60 kilometers (37 miles) from the Ukraine border. But when they did finally try to land, something went catastrophically wrong. Their plane plummeted to Earth and exploded in a huge fireball, killing everyone aboard. Grainy video footage, apparently from a security camera near the airport that was posted on Russian websites, showed a plane streaking toward the ground at a steep angle, then exploding. The powerful explosion left a big crater in the airport's runway and pulverized the plane, but investigators recovered both flight recorders. The cause of the crash wasn't immediately known, but officials and experts pointed at a sudden gust of wind as a possible reason. "By all appearances, the cause of the air crash was the strongly gusting wind, approaching a hurricane level," said Vasily Golubev, governor of the Rostov region 950 kilometers (600 miles) south of Moscow. Emergencies Minister Vladimir Puchkov said the recorders were being flown to Moscow late Saturday for examination by experts from Russia, the United Arab Emirates, France and the US; the US-made Boeing had French-made engines. It was FlyDubai's first crash since the budget carrier began operating in 2009. 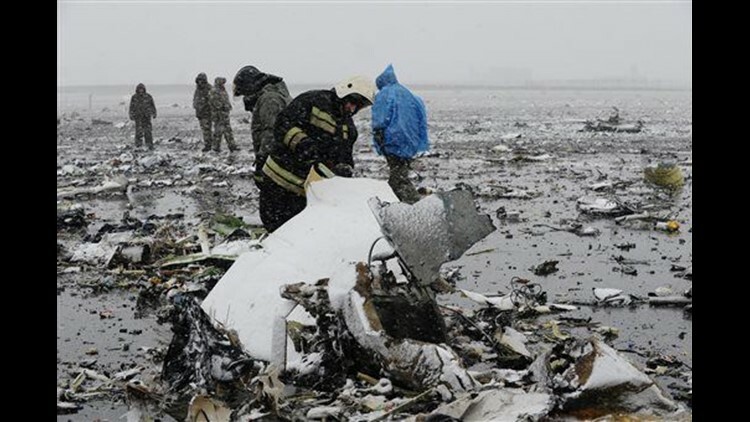 Its fleet consists of newer 737-800 aircraft like the one that crashed. The plane's 55 passengers, 44 of them Russian, ranged in age from 4 to 67; eight others were from Ukraine, two were from India and one from Uzbekistan. Its crew of seven was an ethnic melange — two Spaniards and one person each from Cyprus, Colombia, Russia, the Seychelles and Kyrgyzstan. Dubai is a popular destination for Russian vacationers and many Russians work in the city. The carrier has been flying to Rostov-on-Don since 2013. According to weather data reported by Russian state television, when the FlyDubai plane first tried to land, the winds at ground level weren't dangerously strong, but at an altitude of 500 meters (1,640 feet) and higher they reached a near-hurricane speed of around 30 meters per second (67 mph). Later, when the plane crashed, winds near the surface reached 22 meters per second (49 mph) and could have been even stronger at altitude. Ian Petchenik, a spokesman for the flight-tracking website Flightradar24, told The Associated Press that the FlyDubai plane missed its approach, then entered a holding pattern, circling for about two hours before making another landing attempt. FlyDubai CEO Ghaith al-Ghaith said the plane attempted to land in line with established procedures. He added the pilots had not issued any distress call and hadn't attempted to divert to an alternate airport. Russian news websites released a recording of what was said to be the final communications between the plane and air traffic controllers, in which the pilot repeatedly but calmly asks about weather conditions. Flightradar24's data indicated that the Dubai plane began climbing again after a go-around when it suddenly started to fall at a vertical speed of up to 6,400 meters per minute (240 mph). "It was an uncontrollable fall," veteran Russian pilot Sergei Kruglikov said on state television. He said a sudden change in wind speed and direction could have caused the wings to abruptly lose their lifting power. He said the pilots would have known seconds before the crash that they were going to die but the "passengers and the cabin crew likely didn't realize they were facing imminent death." Russian Pilot Vitaly Sokolovsky told Rossiya 24 television that a sudden gust of wind could be particularly dangerous at low altitude while the plane was flying slowly at low power and the pilot was throttling up the engines to make another landing attempt. The plane's captain, 38-year-old Cypriot Aristos Socratous, was happy working for FlyDubai but was planning to leave them for a job with Ryanair in Cyprus, a friend told The Associated Press. Socratous' wife is to give birth to the couple's first child in a few weeks and Socratous wanted to raise his family at home, the friend said, speaking on condition of anonymity due to the sensitivity of situation. Al-Ghaith said the plane's two pilots — from Cyprus and Spain — had 5,965 and 5,769 hours of flying time respectively, making them "quite experienced." The plane was built in 2011 and underwent a detailed maintenance inspection in January, he added. "As far as we know, the airport was open and we were good to operate," al-Ghaith said, adding that the plane couldn't have landed without air traffic controllers' permission. Russian President Vladimir Putin offered his condolences to the victims' families and top Russian Cabinet officials flew to the crash site to oversee the investigation. Although the airport was closed to further flights, a steady trickle of local people came to the terminal Saturday to lay flowers and stuffed toys in memoriam. Relatives of the victims were kept far from any media. Alexander Neradko, head of the Russian state civil aviation agency, Rosaviatsiya, said it was up to the pilot to decide if weather conditions allowed the landing. He said traffic controllers in Rostov-on-Don had acted in line with standard instructions. "Our air traffic controllers were acting in full accordance with international rules and there is no reason to talk about any flaws in their work," he said from Rostov-on-Don. Transport Minister Maxim Sokolov, who also arrived in Rostov-on-Don, said the airport had undergone a "complete overhaul" last year and received "all the necessary clearances, including international ones." Officials said the plane and bodies of the victims were blown into small pieces by the powerful blast, making the identification process long and difficult. Investigators, however, said the plane's cockpit conversation recorder and another one recording flight data were in satisfactory condition. FlyDubai was launched in 2008 by the government of Dubai, the Gulf commercial hub that is part of the seven-state United Arab Emirates federation. It has expanded rapidly in Russia and other parts of the former Soviet Union. The airline has a good safety record. In January 2015, one of its planes was struck on the fuselage by what appeared to small-arms fire shortly before it landed safely in Baghdad. Adam Schreck and Jon Gambrell in Dubai, Menelaos Hadjicostis in Nicosia, Cyprus, and Frank Jordans in Berlin contributed to this report.